I've always loved the look of bead weaving designs but have never had the patience to learn the technique. I gotta tell ya, I love the way these bracelets turned out today. I used the new seed beads that I got from Twisted Sistah Beads and Fiber- they are funky little drop shapes, and worked perfectly to weave with this bicycle chain. If you like the feel of bead weaving, with a little extra weight from the chain/ artisan made findings, these bracelets will be perfect for you! They are all 7.25 inches long. 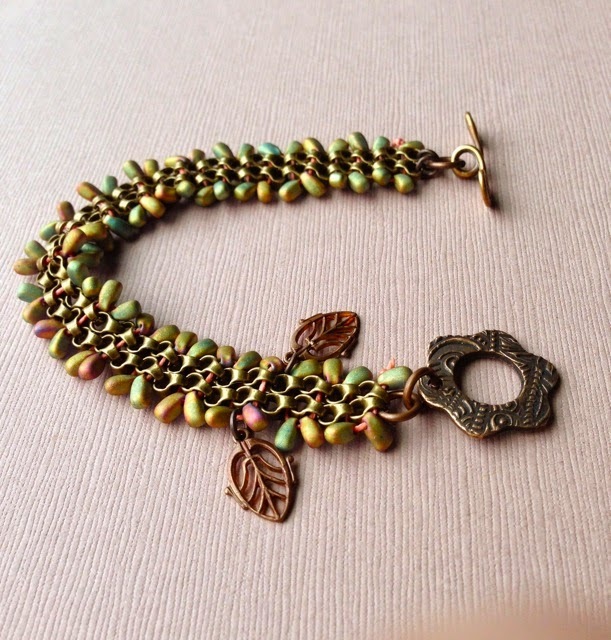 The far left, is a gold/green iridescent seed bead, and I used a great handmade bronze toggle from Starry Road Studio, and some filigree leaves from Vintaj Brass Co. 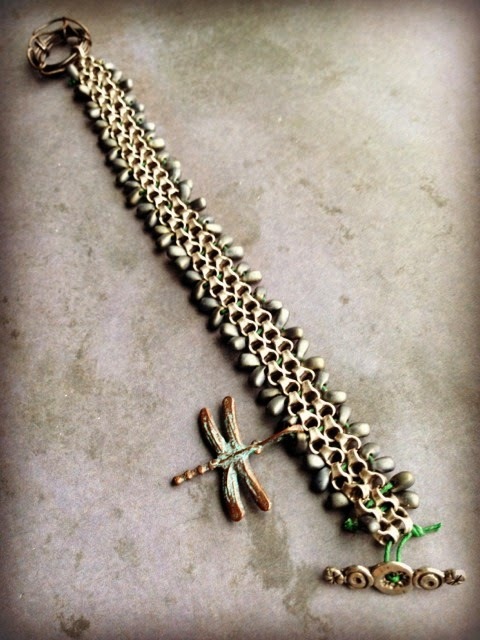 The middle is pewter chain, teal picasso seed beads, and a bee/flower pewter clasp from Green Girl Studios. And then the far right, is pewter chain with pewter color seed beads, a pewter toggle button from Mamacita Beadworks, and I made the steel wire toggle, and I used a Mykonos dragonfly charm from Stinky Dog Beads. They are listed here, on etsy. 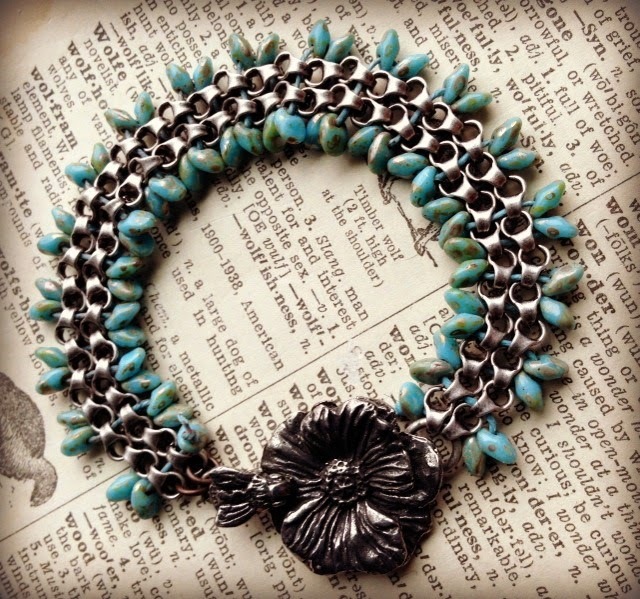 Seriously gorgeous design Lorelei! 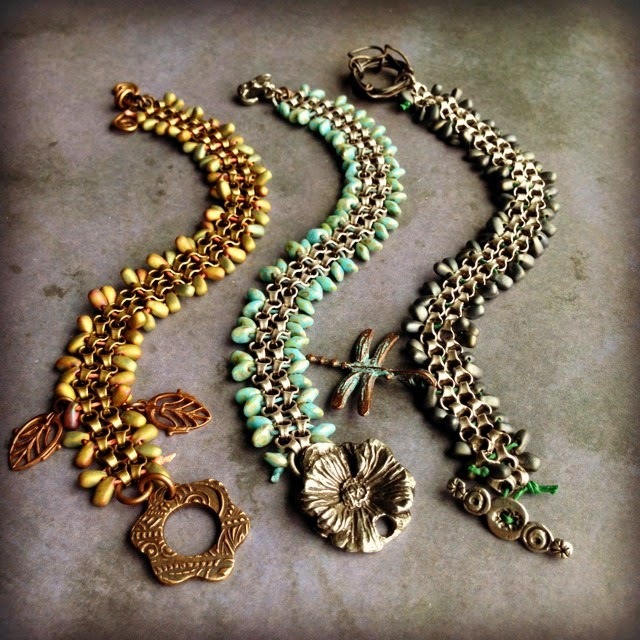 Love the color and texture of each and the clasps and charms you selected really makes each piece unique. Wow - love the design. All of them! Great bracelets! What issue is the tutorial published in ? I would love to try this, but I can't seem to find that type of chain anywhere. Can you tell me, where did you find that cool chain? These are just beautiful! I love your colors!